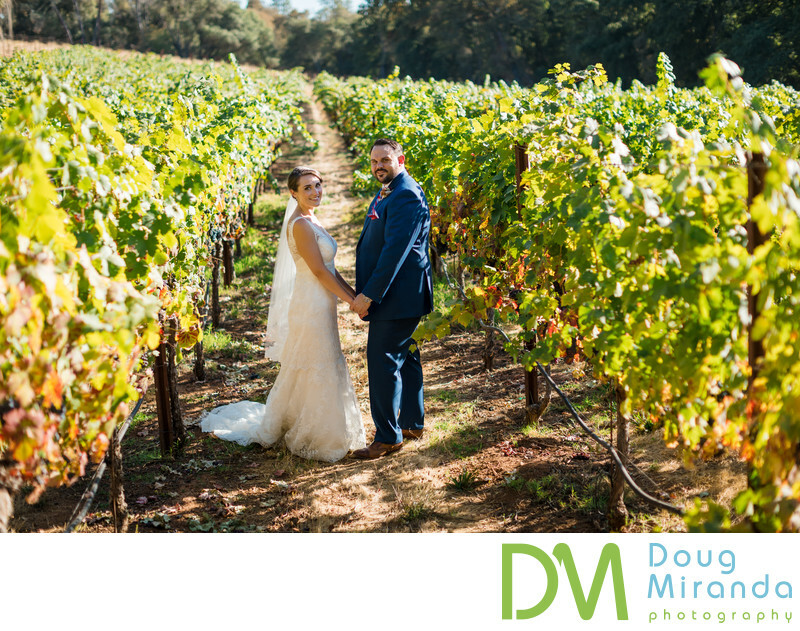 Durning this couple's fall wedding the vineyards were just starting to turn to there golden color. So there was a nice transition from green to gold vines, which made from some great pictures. I had the couple walk about a hundred feet into one of the vine rows and turn back at me as they stopped walking. By doing this you'll get more of a natural portrait. Cielo Estate Winery is romantic wedding venue located in the foothills of El Dorado county and is about 30 minutes from Sacramento California. Besides it being an event center it’s an active winery and has a spacious tasting room on the property. The sprawling estate covers 17 acres of vineyards, open fields and oak tree forests. On site is an historic old Victorian house from the 1800’s that has been restored immaculately. This is the location for the bridal party to getting ready in. The house also servers as a prefect place to take photos at with it’s covered porch and lovely rooms inside the house. It’s also a great place for the bride and groom to cool off in during those hot summer days. Also on the grounds is the large Lake Vila that can be rented out separately during your event. This is a great place to stay before and after your wedding day. You can also host your rehearsal dinner at the Lake Vila. It also serves as another getting ready location for the bride and groom. There also endless amounts of photo opportunities over by the vila. Your wedding ceremony will take place on a grassy hillside under their iconic white gazebo that is under a giant oak tree. 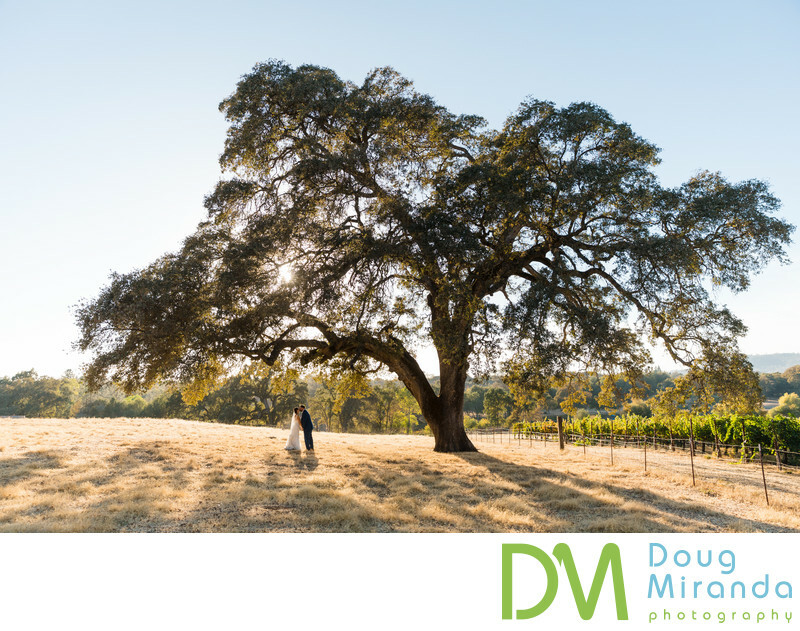 The backdrop is one of the many vineyards on the grounds and more oak trees. The site is located right next to the victorian house and just a short walk is the reception and cocktail hour location. The gazebo serves as a great backdrop for family photos and bridal party portraits. The reception will take place in a large event center that has vaulted ceilings with many large windows that let in nice ample natural light into the ballroom. Their a giant back deck to the building where the cocktail hour can take place on with views of the vineyard and forest. The deck can also serve as your dance floor for the night too. With Cielo Estate Winey being the closest foothill winery that host weddings to Sacramento it makes perfect since to host your special day here. This is a list of some of the services that they offer for weddings and events. Use of the gazebo for your ceremony. Tables and chairs for the reception. Bridal party getting ready area in The Farmhouse. Table settings with liens, flatware, china and glassware. Staff for set-up and clean-up. Location: 3040 Ponderosa Rd, Shingle Springs, CA 95682. Keywords: Cielo Estate Winery (21).